All bets are off when it comes to dining at parties. At least that's what I tell all my relatives when we invite them over for the holidays. Everyone should indulge in "rich" food every once in a while. It's good for the soul. With that in mind, we decided to cook dishes that were moderately healthy so there are no ifs and buts about what to eat. The following recipe was one of my favorite vegetable curries that was served at our Diwali / Thanksgiving holiday party last month. 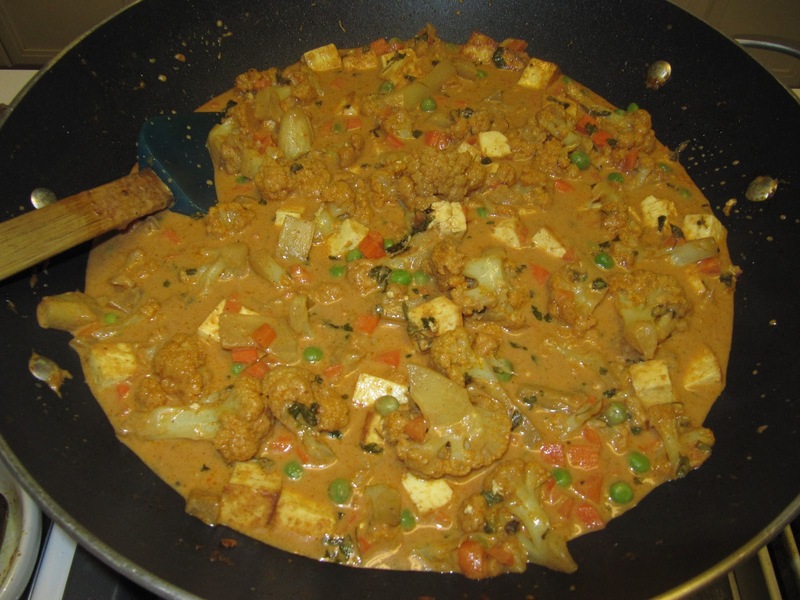 I love the addition of Paneer (Indian cheese) which added some nutritional value to the dish. Barely any of this dish was remaining towards the end of dinner. It was a great complement to the vegetable biryani and rotis that were also served. 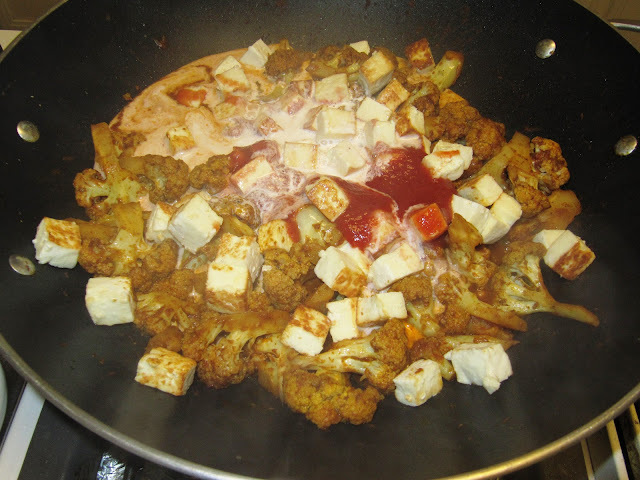 In a non-stick skillet, heat oil and add paneer cubes. Stir until they are lightly fried. (Hint: Edges of the paneer should be brownish color). Then add dhanjeera powder, turmeric, chili powder, and garam masala. 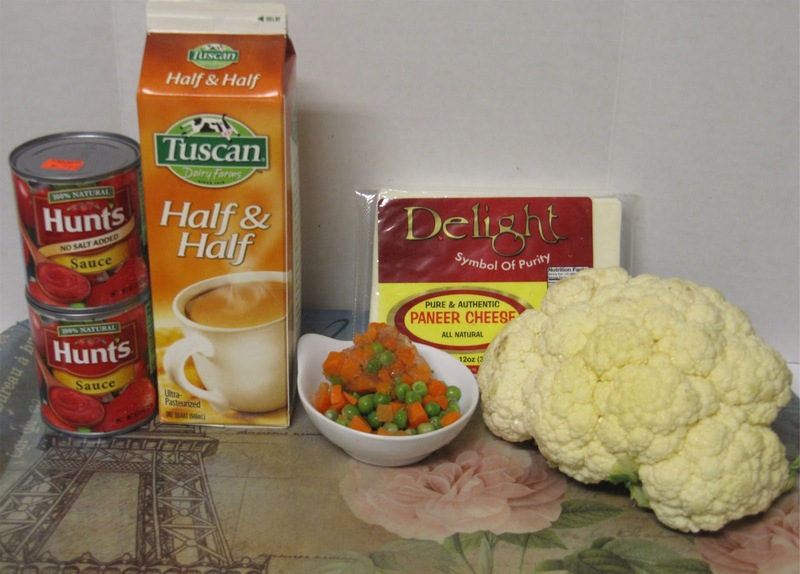 Mix well and then toss in the cauliflower florets. Add salt and cook the mixture under closed lid until the florets are cooked all the way through but are still firm. Then add tomato sauce and cook for 5 more minutes. Finally, add the frozen carrots and peas and half & half. Cook for another 5 to 7 minutes or until the mixture is thick and the curry will be ready to be served. I've been looking for more ways to use Cauliflower and this looks delicious, and surprisingly easy! Hey, I don't know if you'd be interested, but I'd love to interview for WanderFood, maybe with an easy recipe thrown in. Let me know! My email is lauren (at) wanderlustandlipstick (dot) com. It is pretty easy. Just cutting up the veggies and throwing some spices together. Let me know how it turns out. And actually, I made this last night and turned out pretty well. I didn't have half & half and paneer so substituted the ingredients with Tofu and Evaporated milk and the dish is still quite tasty.